Today I am taking advantage of some bulk dried cannellini beans that my husband picked up earlier in the week at Whole Foods (left). After I rinsed, picked out the ugly beans, and soaked overnight in cool water, I drained and rinsed again. I put them into my pot, covered in fresh water a few inches over the top and added – a sliced onion, 2 stalks of celery, a few carrots, a few springs of thyme and 5-6 whole black peppercorns and a splash of good olive oil. That’s it! Simmer for an hour and keep tasting for doneness (sometimes it takes only an hour sometimes 2- beans are finicky). When you are happy, add salt. Let them cool and keep them in your fridge for 4-5 days. Now you can use them to make lots of yummy dishes (below), or if you’re like my oldest son just a bowl heated with a slab of bread and butter for breakfast. To make this easy and delicious soup you can use canned beans and it will be just as delicious… Enjoy! Sauté the bacon, onion, carrots, celery in the bottom of a heavy soup pot until tender – 8-10 minutes. 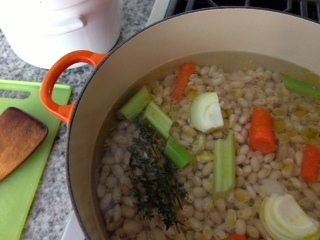 Add the chicken stock, thyme, and white beans 1 tsp. of salt and fresh ground pepper. Simmer while cooking the pasta. Cook the pasta in salted water until slightly underdone, drain and set aside. 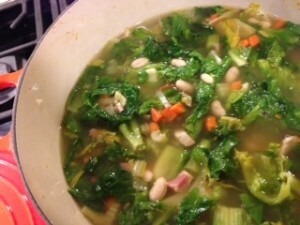 Add escarole to the soup and simmer for another 10 minutes until escarole is cooked. Add parsley. Season to taste and add cooked pasta to heat through. Serve with crusty bread and grated Pecorino cheese. Leave a comment below and tell us how you enjoyed the soup, and what types of recipes you would like to see in the New Year. Buon Appetito!